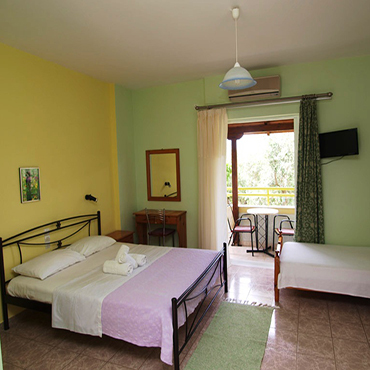 Rented apartments ELENA are found in Stoupa Messinia in a quiet region, hardly 200 metres from the beach. The apartments allocate 1 four-bed room, 3 double-beds room and 2 three-beds room apartments. It is category A, with completely equipped cooker, air conditioning, television, telephone with exterior line while exists private parking. Also Free WI FI. In 10 metres it is found super market for your shopping's. Stoupa is a wonderful, graphic village 45 km from the airport of Kalamata that combines unique natural beauty and excellent sandy beaches for your swimming.